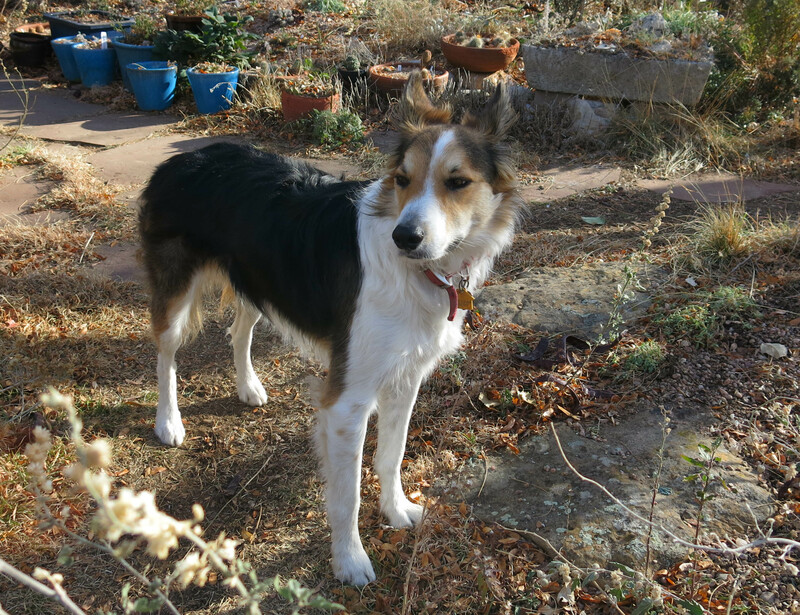 Greetings and salutations, everyone; yes, once again it is I, Mani the purebred border collie, filling in for the guy I live with, and here to bring you up to date on the latest news from our garden. You may remember me from such posts as “Still Not Much Happening”, among so many, many others. Here I am in a characteristic pose. I guess you can see that there are still locust pods in the garden. In fact there are pods everywhere, just not so many here. The guy I live with is very tired of raking up pods. Nothing has been happening here, except for pod-raking. 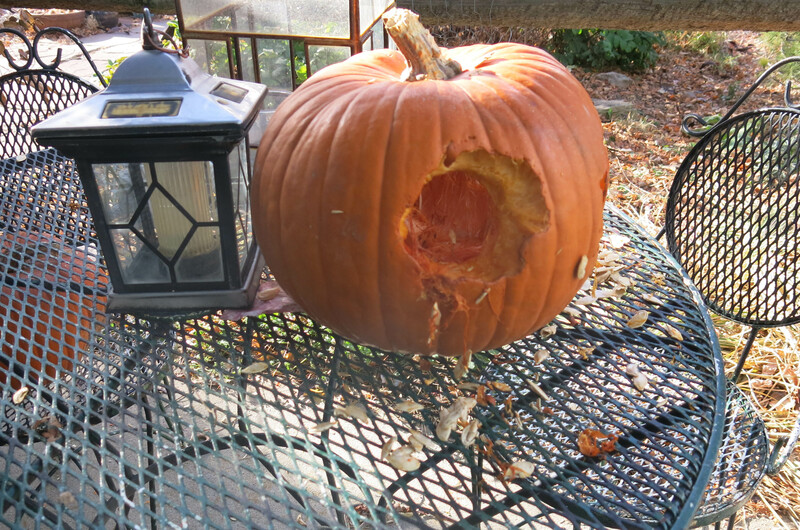 Oh, squirrels have been chewing holes in the pumpkins, to get at the seeds. And iris seeds are being soaked. This isn’t something I find hugely interesting. 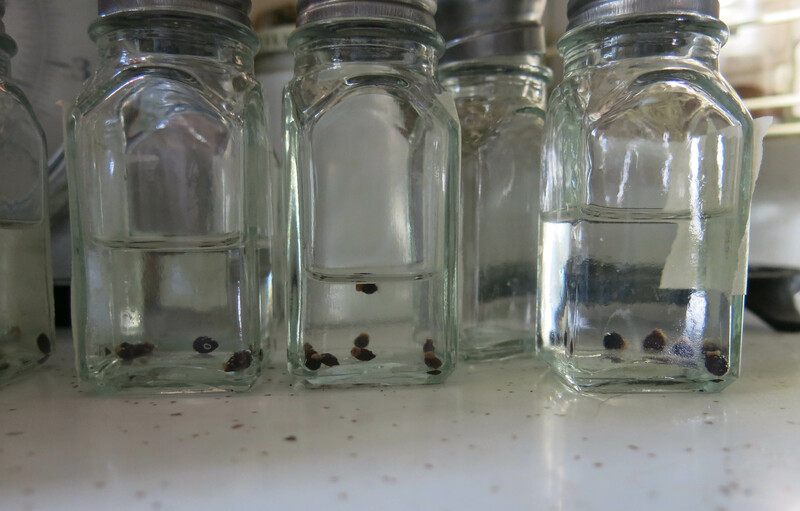 The guy I live with gets iris seeds from friends, and he germinates them, grows them into little plants, and gives the plants back to the person who gave him the seeds. It’s just a thing he does. Sometimes he gives the little irises to Denver Botanic Gardens, too. There was a funny thing about the salt shakers. He got these from Amazon, and later got a request to review them. They aren’t used for salt, so his review might have been completely weird. They didn’t get reviewed. They’re salt shakers. I stand out in the garden, sometimes. I figure you probably knew this, but I just wanted to make my post a little longer. The guy I live with says that we’re entering “the bleak season” now. There are some snowdrops flowering, but other than that, things just stay like they are, for a couple of months. It might snow, and then again it might not. This is pretty much how it will look here, if it doesn’t snow, until next year. Maybe it isn’t so bleak after all, but of course I always follow what they guy I live with says, and if he says this is bleak, he must be right. I don’t have much of anything else to say. We saw a big hawk on our walk yesterday evening, but no one had a camera, so you’ll just have to imagine it. There was Thanksgiving, but I stayed home while the guy I live with went to eat turkey with his friend and her mom. I don’t particularly care for turkey, so it worked out okay. He wasn’t gone very long, anyway. There is one thing the guy I live with said to mention. This is now about his favorite book. Naturally, it’s for kids about five years old, and I’m not going to say what I thought when I learned that, but I hear it really is a wonderful book for little kids who have dogs. The guy I live with gave it to a few neighbors who have little kids and dogs. Just to be friendly and stuff. It’s about a dog named George, if you couldn’t tell. That really is all I have, for now. The guy I live with applied for renewal of his seed importing permit, and got that, but still has to get the labels that go along with that, and when he does, I might talk about that some more. There are things to say about it. Some possibly interesting. Or possibly not. 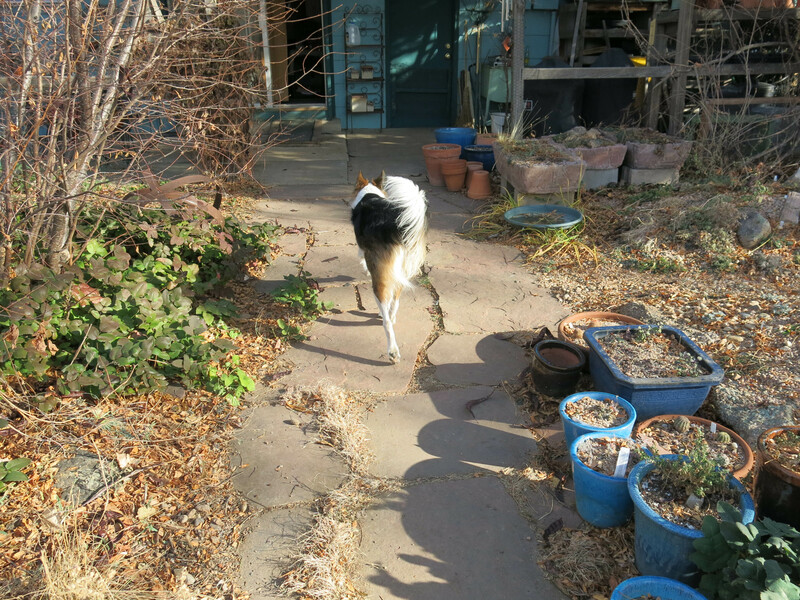 Mani – if TGYLW is on Twitter, he might like to check out the user MontysDogNigel. Monty Don is the presenter on our national gardening program on British TV, and Nigel is his sidekick. Many say that it’s Nigel’s programme with assistance from Monty. No; we don’t do Twitter, but maybe we should. Mani you are the cutest thing! Thanks; I might have to agree. Not to be immodest or anything. The garden looks fascinating to me. Well, semi-fascinating. The pods add an extra tough. And by the way, they make excellent snacks. PS. i caught up but can’t comment on previous posts. Have been obsessed with news to the detriment of reading my two favorite blogs. i must comment that your legs are so long! Thanks for the reminder of what a truly great bulb Prinzes ? Irene is. Must get hundreds next year. Mine may have petered out. Love the coyote videos. Sometimes at night I hear them on the outskirts of town. 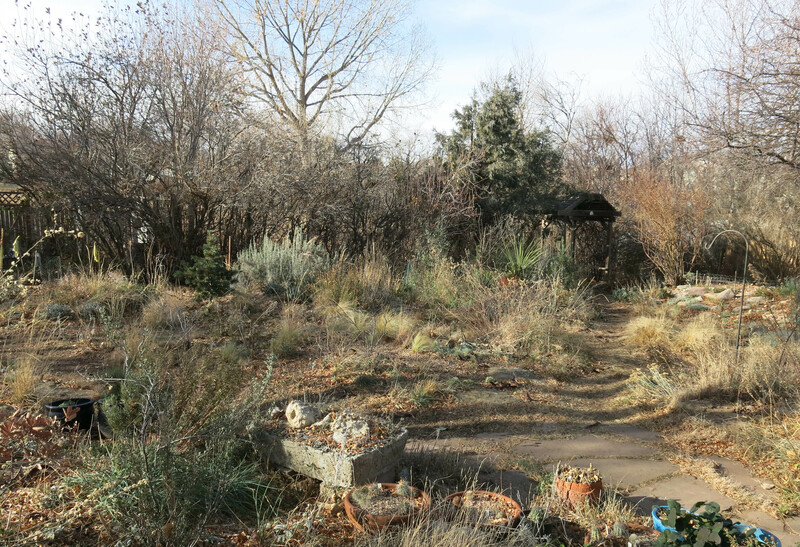 Your garden looks like part of the wild, in a beautifully designed way. I remember the era of cacti in the blog! Thanks; yes, you should get Prinses Irene, and Couleur Cardinal, too. The first was a sport from the second. The guy I live with says to plant a whole bunch of Prinses Irene, and then a few clumps of Couleur Cardinal. Not intermixed, just clumps here and there. They go together. The cacti, well, there are a lot of them, and the guy I live with says that because summers are so dark here, they rarely flower, and so I guess some are going to go. I will try that combo for sure. Has Victoria Secret contacted you, Mani, about walking the runway? You’ve certainly got the legs and arrogant bony framework to really work it. Plus, your last photo has all the dismissive hauteur one would expect from a VS supermodel. The guy you live with’s garden is *interestingly* bleak with a picturesque quality. And a bleak quality means you can jazz life up around Solstice with a celebration of lights and then onto the revels of Twelfth Night. Of course, after that comes bleak again for however long it lasts. After that, snow, although you’ll probably have to listen to the guy’s complaints. Thank you for the book recommendation. I’m just on the cusp of needing a new book to read. I’m especially spurred to read anything between the covers of excellent colors purple, puce, magenta and saffron. Oh, yes — the guy may be a miserable gardener, but he is also a generous one, not only germinating for passalong but buying the proper salt shaker tools. In the spirit of the Season. Thanks; I don’t think Victoria’s Secret really wants me, because I’m a guy and all, and a purebred border collie. Maybe. I don’t know. 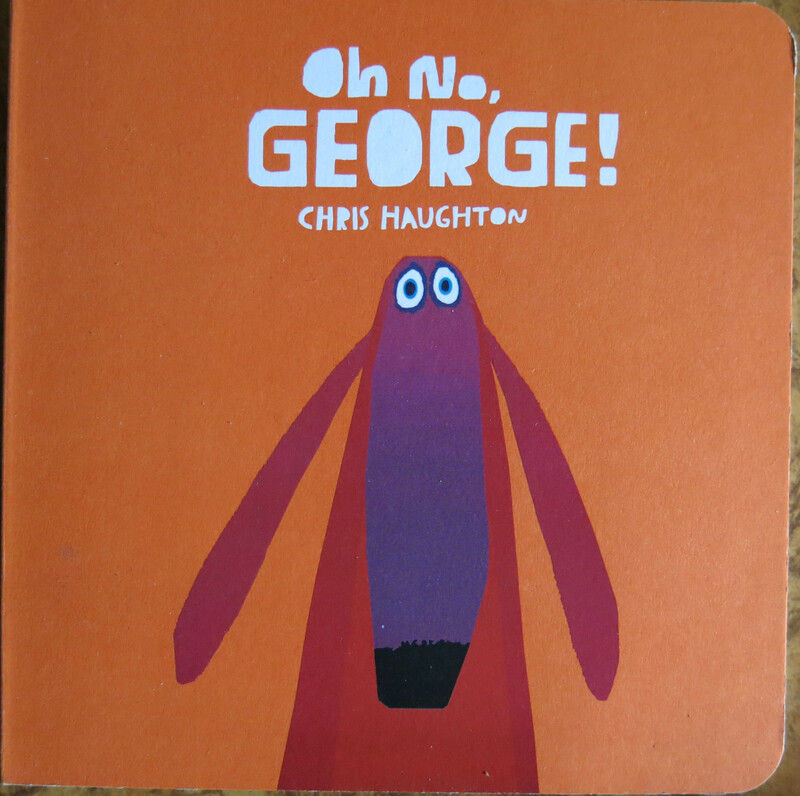 “George” only costs nine dollars as a board book. He says also to check out “Boot & Shoe”. He got some copies for his grandnieces. We don’t know if it’s going to snow a lot here this winter. Things have been so weird. Oh, I love your garden right now. Mine is a sea of gushy rotting vegetation that is going to freeze tonight and look even worse, if possible. Your look of disdain as you survey your surroundings would deepen to disgust if you saw mine. The book! Do you succumb to temptation any more, Mani? You look kind of above it all, but I still suspect you do succumb at time. You know, those pumpkin seeds are really good roasted but the rodents do get hungry this time of year. I wish I could say that I’d gotten my seed permit but it involves going down and showing the government official my ID and so I haven’t. You and the guy you live with set the bar very high for the rest of us. Thanks. 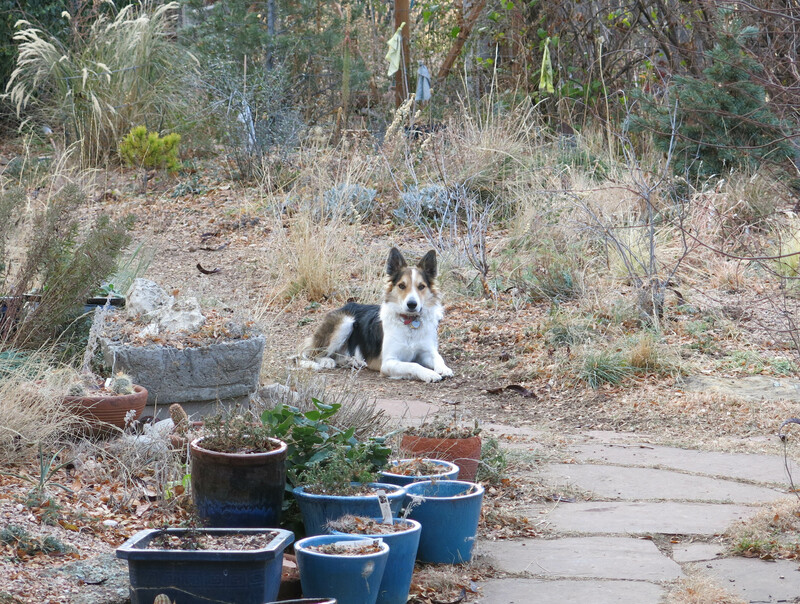 I rarely succumb to temptation these days, except to chase squirrels, and snack on locust pods and pine cones. The guy I live with is against me eating pine cones. It has frozen here a couple of times now. We don’t get frost; it just gets cold. Too dry for frost. Pumpkin seeds are good roasted, with salt, but I think we’re a bit too late here. About the permit. All you have to do is print out a copy of the PPQ-587 form, fill it in exactly the way shown on the NARGS website, and mail it in. You will then get an email saying the permit is being processed (this is new), and then get the permit as a PDF. Then they send you the green-and-yellow labels which are specific to your permit, upon request. We haven’t gotten the PDF with the labels, yet, which we print out in color. (I guess I don’t help with this.) The business about the driver’s license is confusing, but if you do it this way you don’t have to do that. Oh, thanks. There was some stuff about having the right clearance level to even enter the government website and that’s what the ID was for. I really like the government to be as little aware of me as possible. It gets harder as I get older. Sure. It’s all very confusing, but if you just download the form and send it off (do make sure you fill it out exactly, and we mean super exactly, the way the NARGS site says to), the rest is a piece of cake. 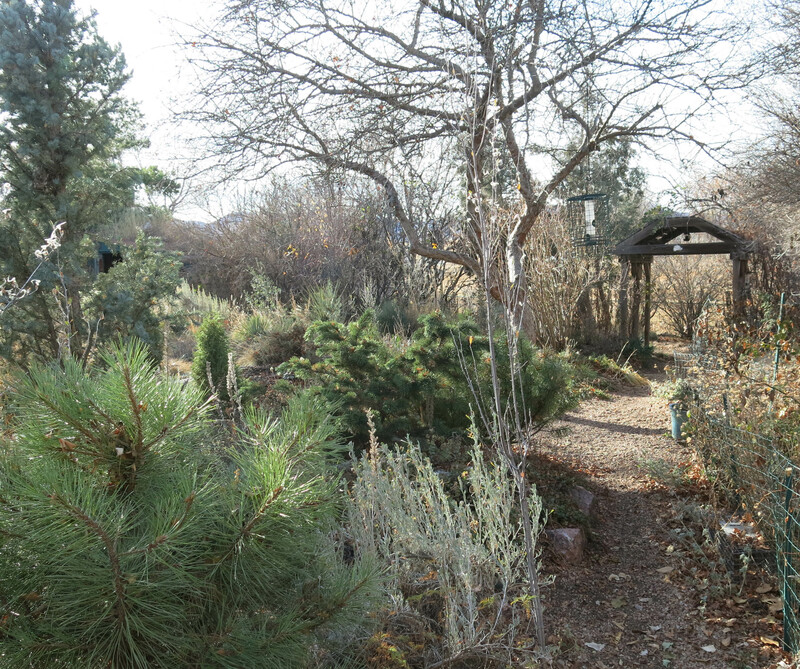 Both the Alpine Garden Society and the Scottish Rock Garden Club do insist on being sent a copy of the permit and a green-and-yellow label when you order from their seed lists. Now, according to the guy I live with, there are some seed lists, what you might characterize as esoteric seed lists, where it’s very difficult to send the permit, since they just send the seeds and bill you later, but he’s never tried those, being the sort of person who tries to be an upstanding citizen and all that.